The Markel family arrived in Ashland County in the 1830s before the county was carved out of Wayne, Richland, Huron and Lorain counties in 1846. Solomon Markle brought his family west from Westmoreland County, PA in 1837. It would take several decades before the family name changed to the current spelling, "Markel". Solomon Markle would locate in Orange Township in 1837, just after marrying Hannah Howman. He would raise five boys and five girls. A second son, Israel, would also remain in Orange Township. 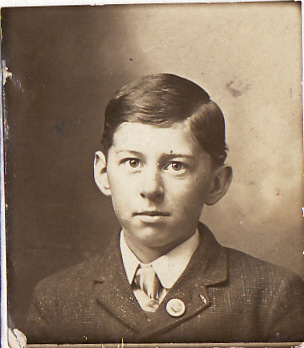 One of Israel's sons, Israel F. Markle, would study to become a doctor after the Civil War and return to the county. 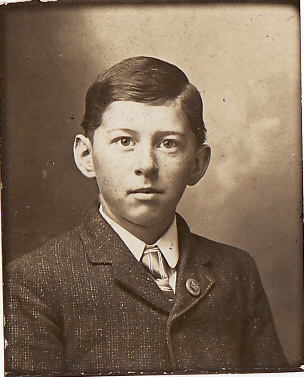 Israel Markel's great grandson, Samuel Lee Markel would marry Lona M. Sponsler on November 30, 1894. Together they would have eight children, many of whom appear in the following photographs. * Samuel and Lona Mildred Sponsler's marriage license shows another case where legal name is different from the name used by the family. 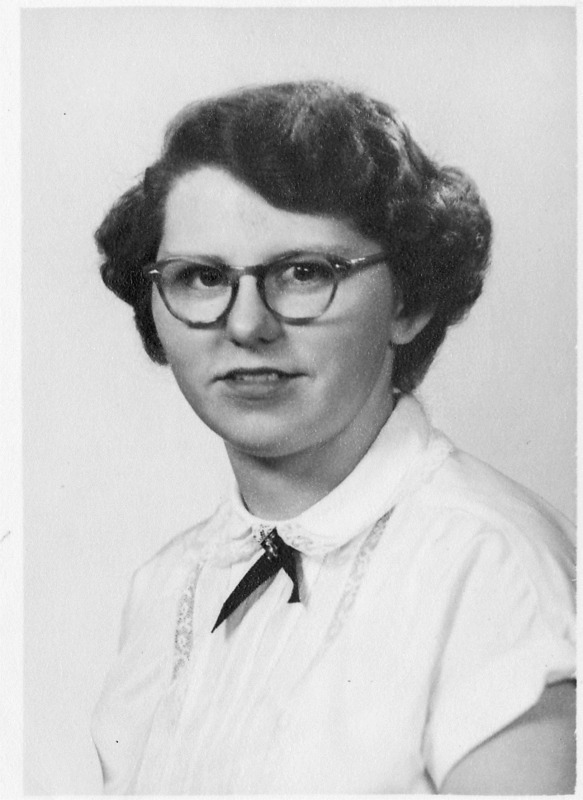 Lona Mildred Sponsler was known to the family as "Nona" or "Nona Mae". 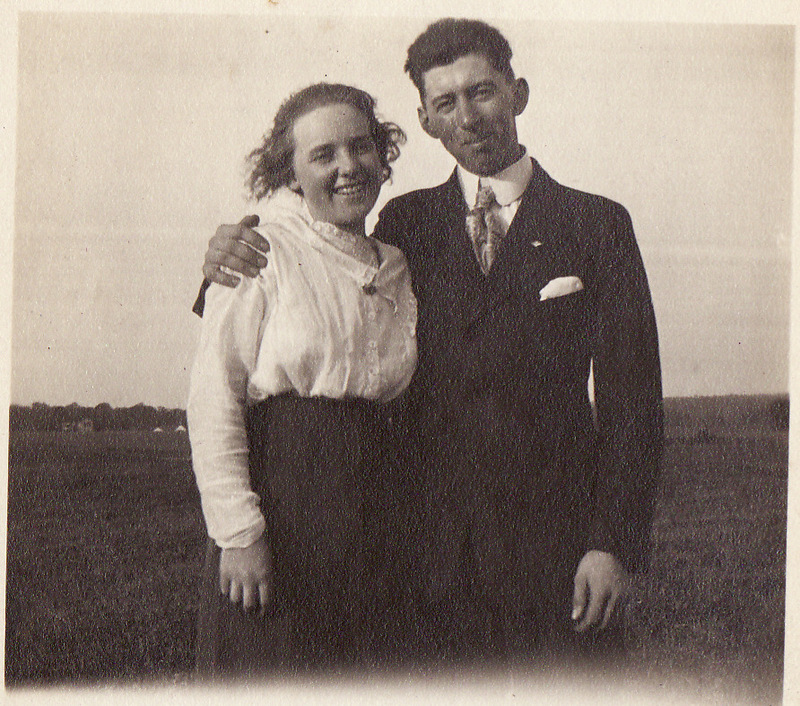 * Samuel and Lona in an anniversary picture, probably in the 1930s. * Samuel and Lona with the children. Back row: Oscar, Stanton, Ross and Laura's husband; middle row: Ola, Lona and Samuel; front: Samuel (Jay) and Wallace (Duff). 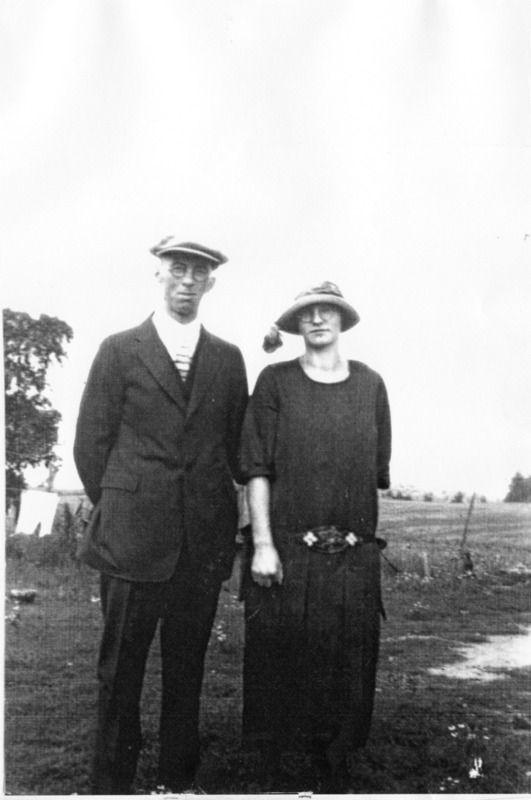 * Samuel Jay Markel and his first wife, Ruth (Meng) Markel. 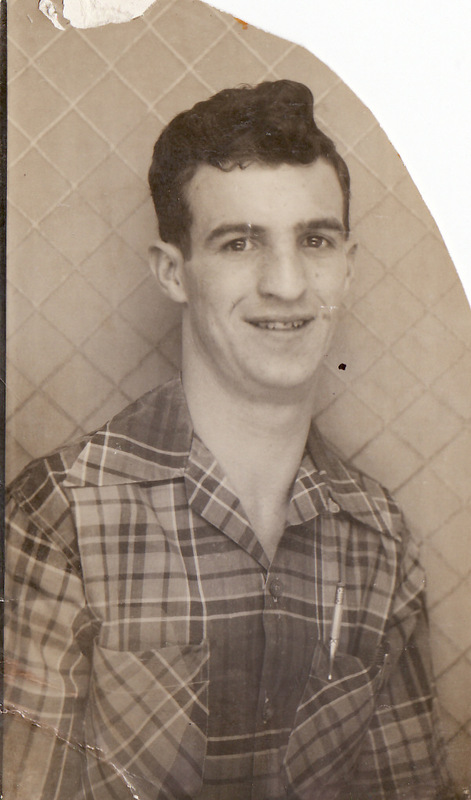 Samuel Jay was a pilot who once had an airport on his farm in Ashland. He would outlive two wives and marry a third time. * Wallace Duff Markel and Beatrice "Mickie" (Forbes) Markel. * Edna Fry Markel (1907-1976) and Jacob Lee Markel (1903-1990). * Bernice Fry Markel (1904-1983) and Oscar Roland Markel (1897-1971) in a wedding portrait. 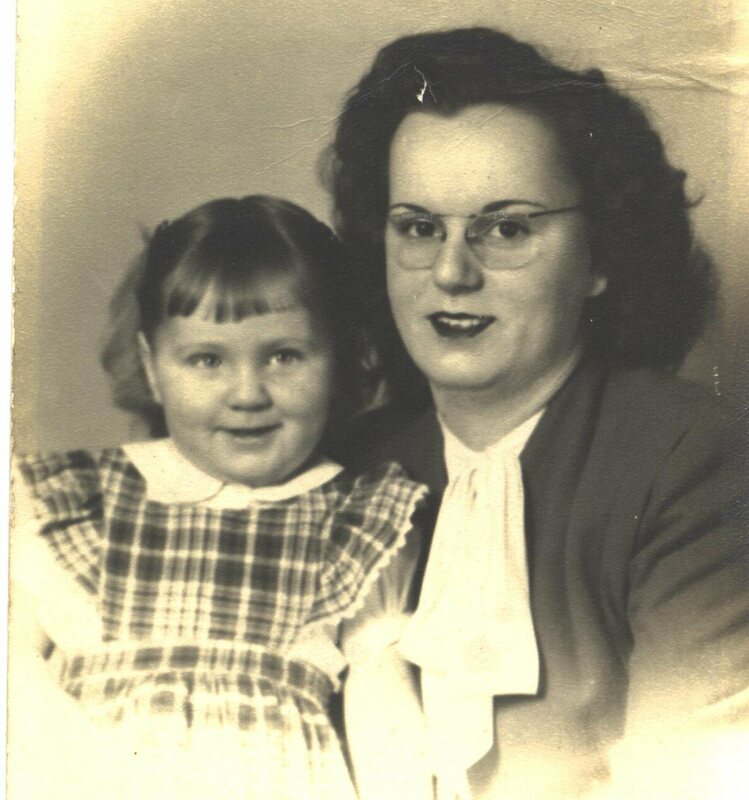 * Lois Markel with one of her daughters. 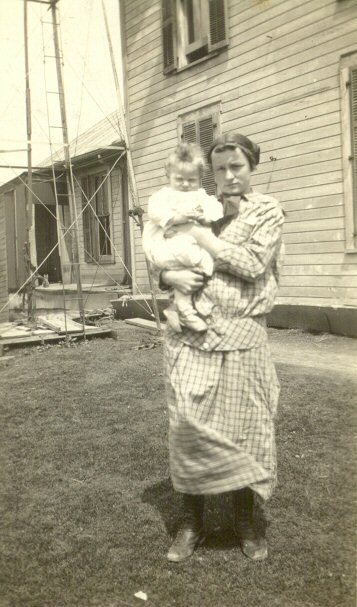 * Bernice Fry Markel (1904-1983) holding one of the babies. 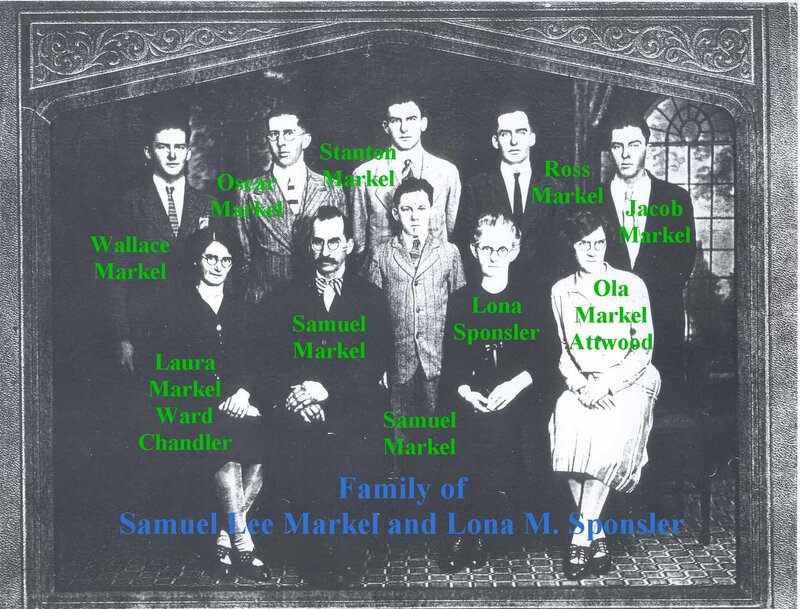 * Markel-Sponsler families about 1930. * Markel-Sponsler families in 1943. 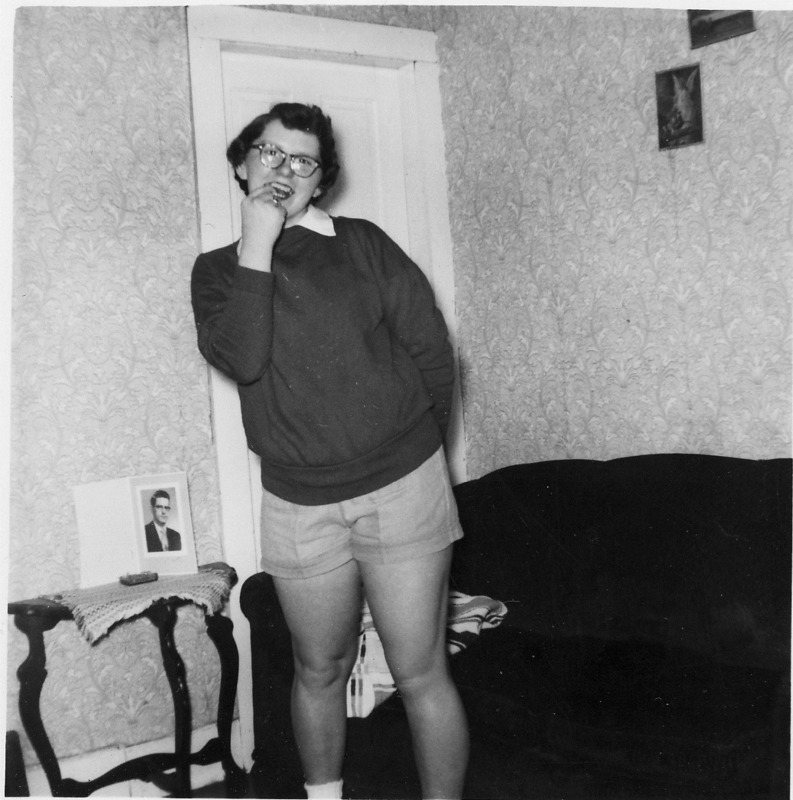 Thanks to Oscar's grandson Greg Markel, we've added enough pictures of Oscar and Bernice (Fry) Markel's family to merit a separate section. In fact there are so many excellent photos of Oscar Rolland Markel that we've given him his own section. Oscar Markel would work as a truckdriver, contractor and Ashland policeman but his weekend passion when young was for his Harley-Davidson motorcycle. 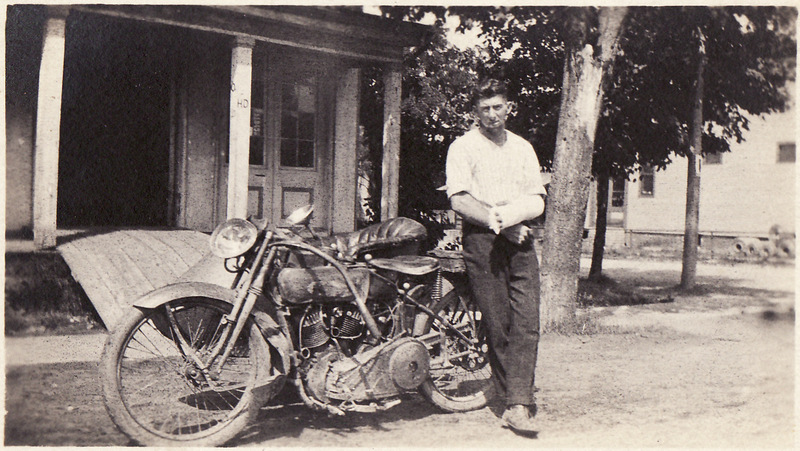 He had been a motorcycle policeman in the city of Ashland but when young he was a motorcycle daredevil, performing at county fairs and street fairs. One was the "Wheel of Death", a cage in which two motorcycles would ride simultaneously. 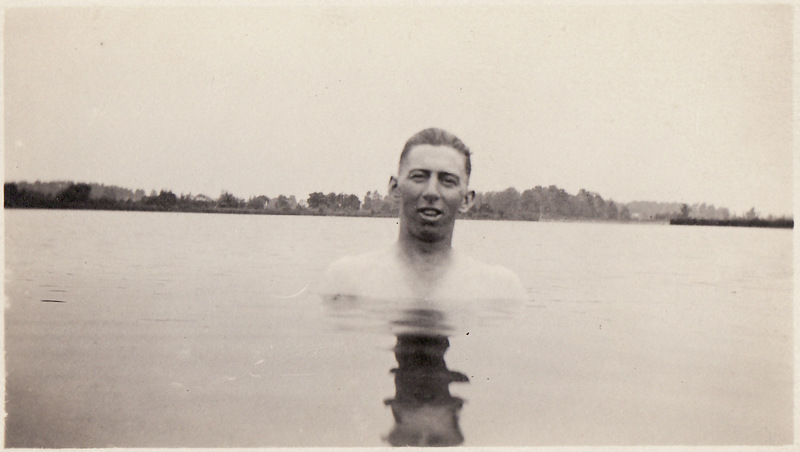 When a brother relocated to Port Clinton on Lake Erie, Oscar would ride north and collect a load of fresh fish. These would go into the cooler in the sidecar of his motorcycle and Oscar would return to Ashland, selling the fish out of the cooler. * Oscar in a series of school portraits, probably about age 12. 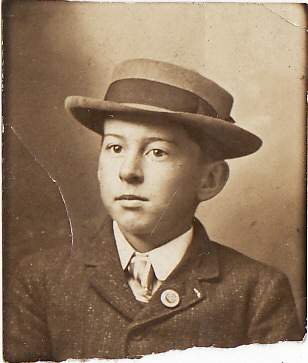 Seen here with a hat. 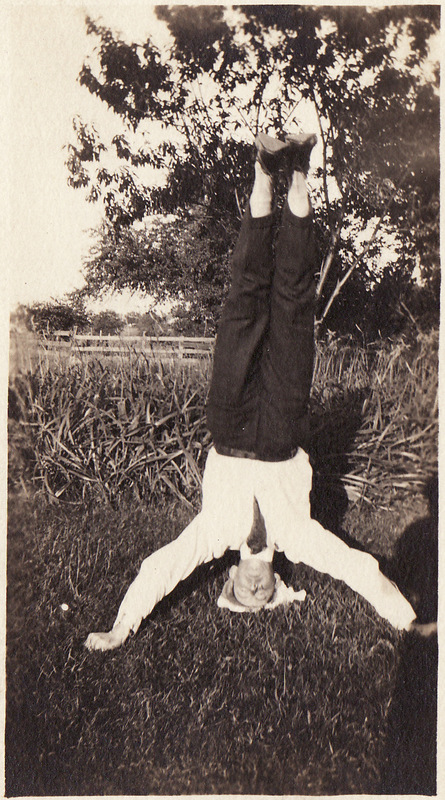 * Oscar in a handstand. 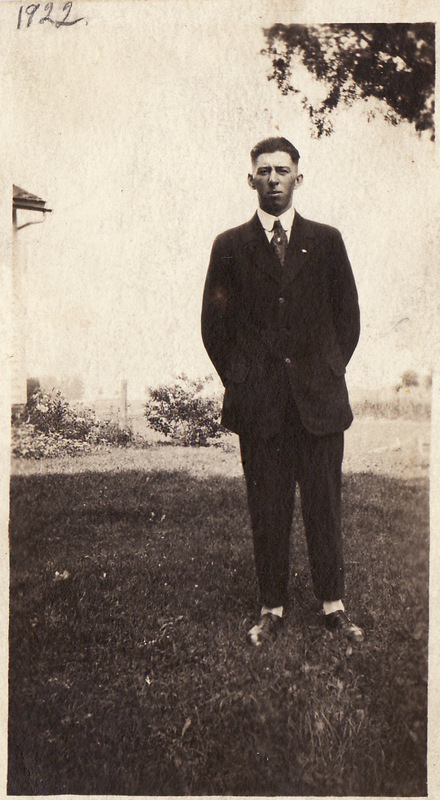 * Oscar Rolland Markel in 1922 at age 25. 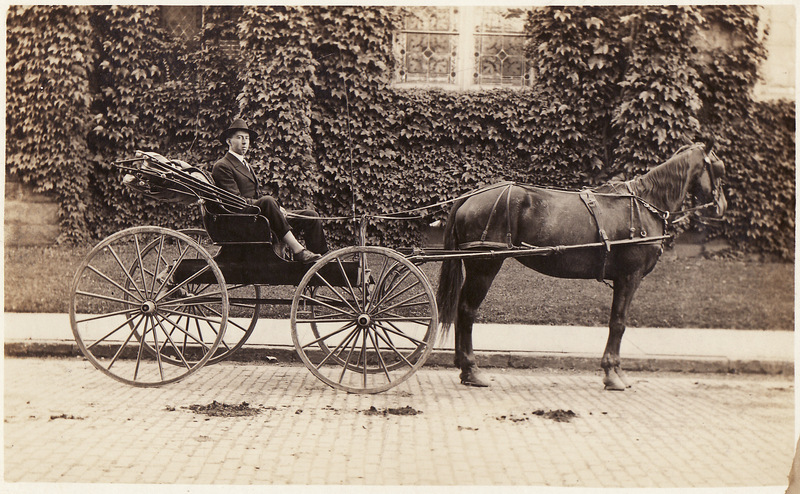 * Oscar at about the same age in an open horse-drawn carriage. 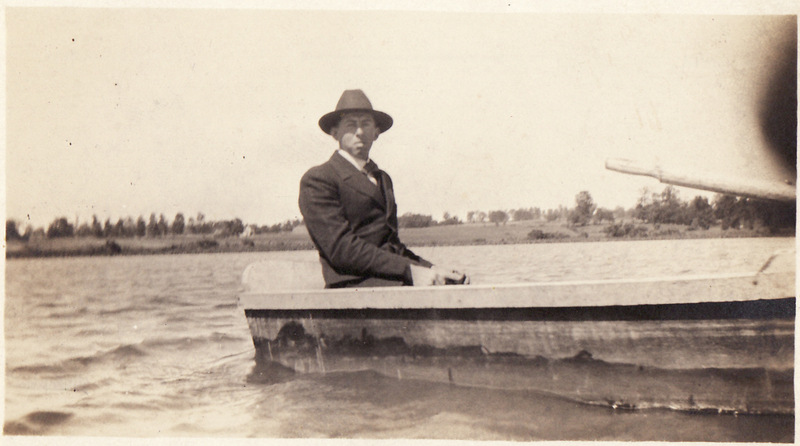 * Oscar in a row boat, complete with suit and tie. 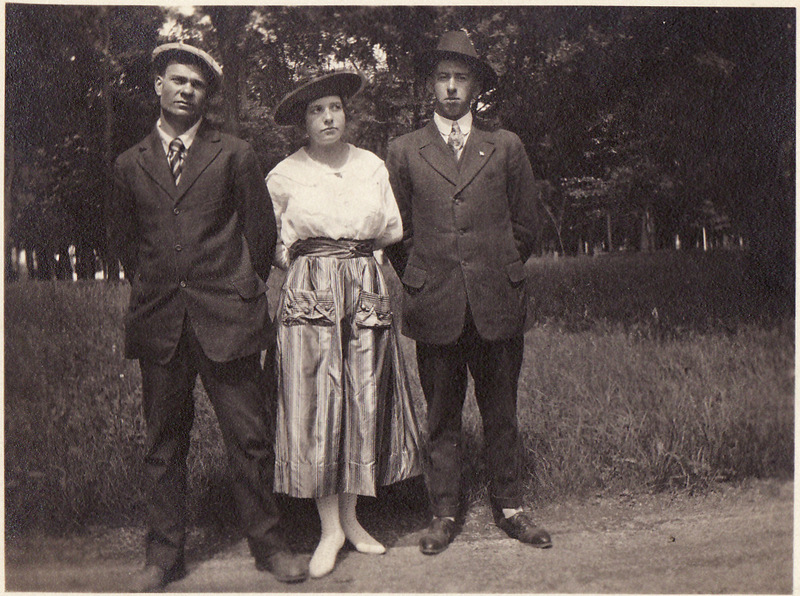 * Oscar Markel with Clarence and Golda, though we don't know the last names of the two on the left. * Oscar with a young lady who may be Ola Attwood (his sister) or Laura Chandler. 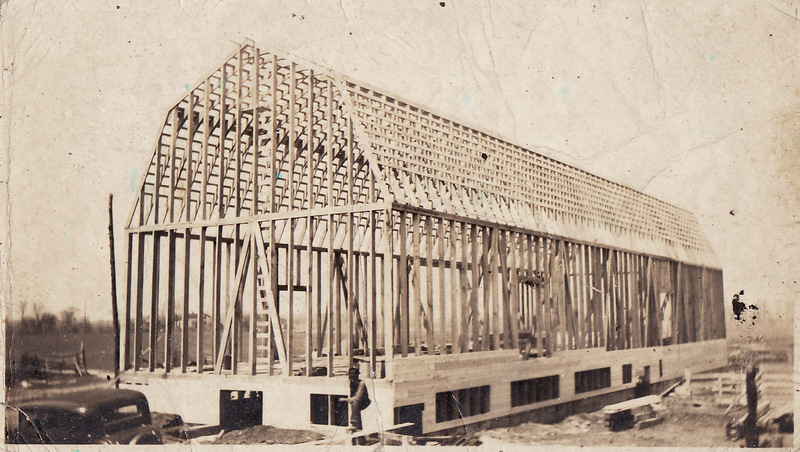 * The Starr barn while under construction, built by Oscar Markel at the corner of Ohio State 18 and West Road in Wellington, OH. 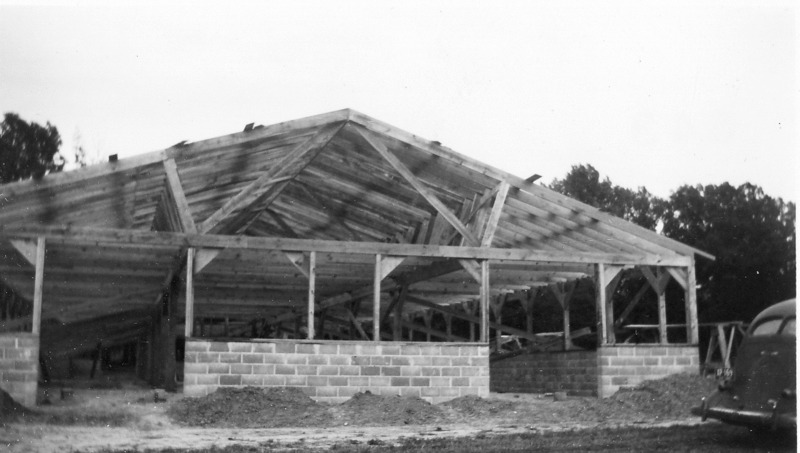 The barn was built for Stanley Sooy. 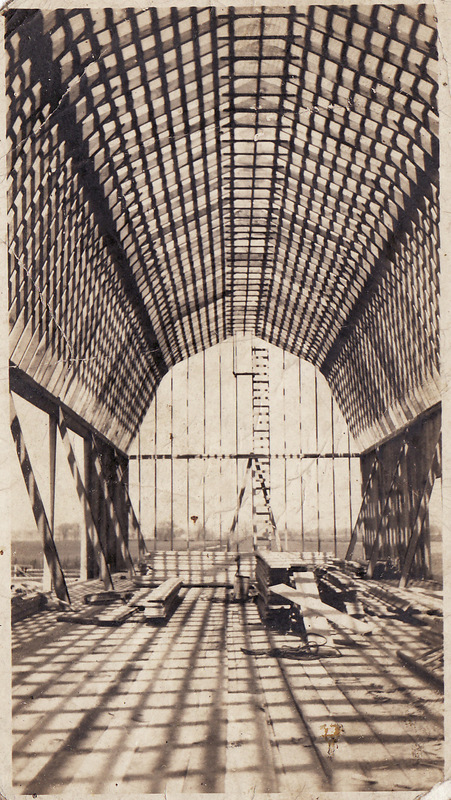 * The inside of the Starr barn. 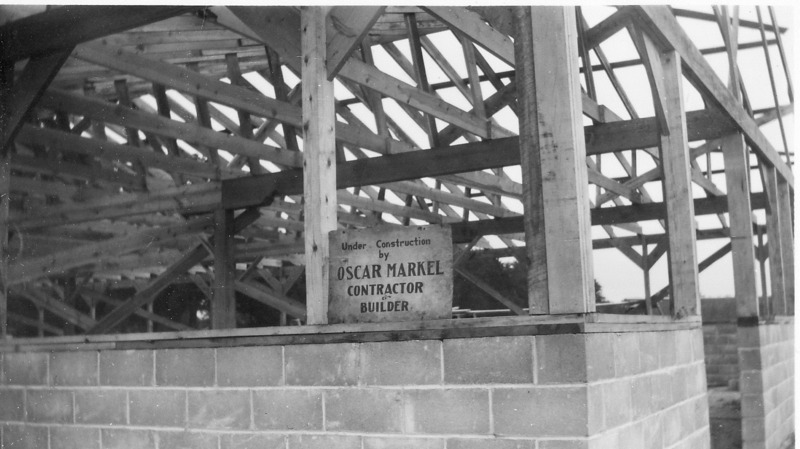 In the mid-1920's Oscar's contracting company would also build the wooden roller coaster at Chippewa Lake Amusement Park near Medina, OH. 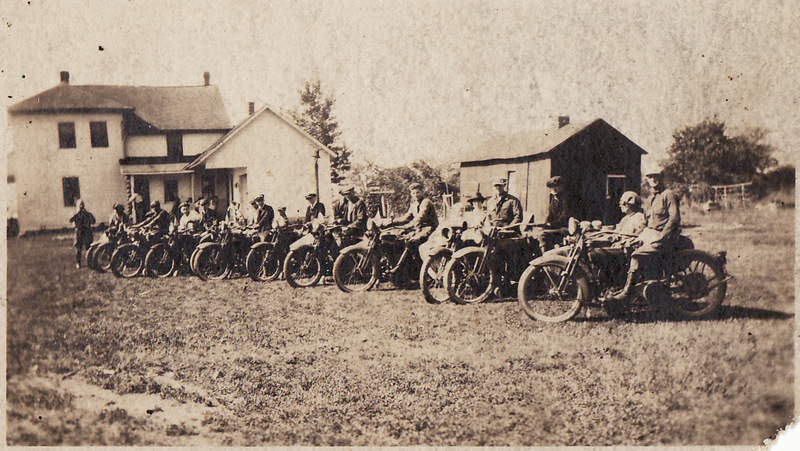 * A motorcycle rally of Harley-Davidson owners, pre-1920. The picture is in the backyard of one of Oscar & Bernice's early residences at Taylor and Hale Streets in Wellington, OH. 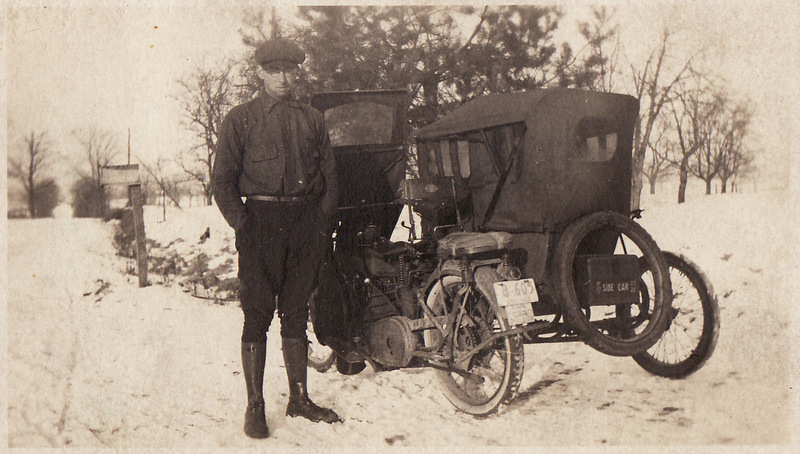 * Oscar with his motorcycle and sidecar, again pre-1920. * Oscar's sidecar, set up for winter operation. 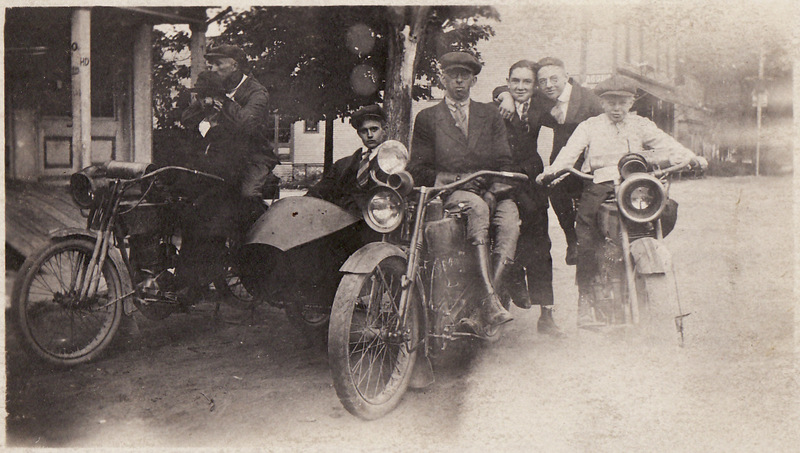 * Oscar and a group of motorcycle fans in Nankin or Ashland, OH, pre-1920. 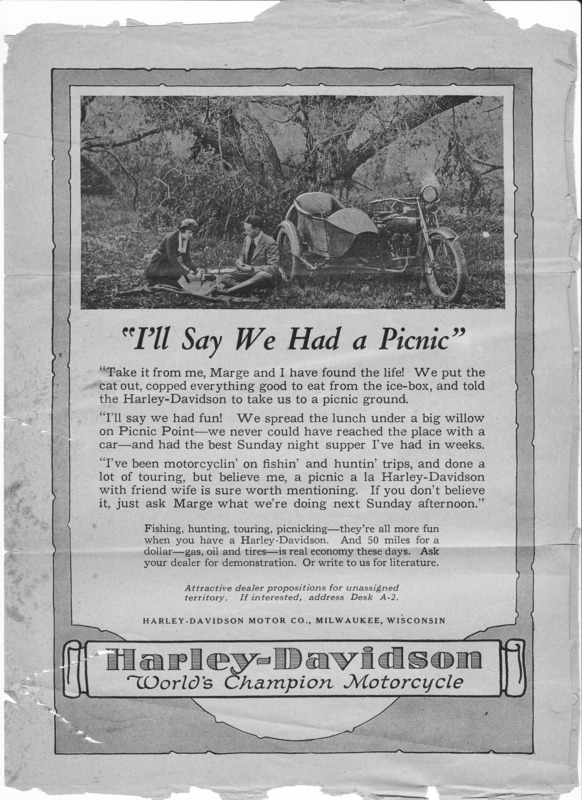 * A Harley-Davidson advertisement that was a favorte that Oscar Markel kept for years. 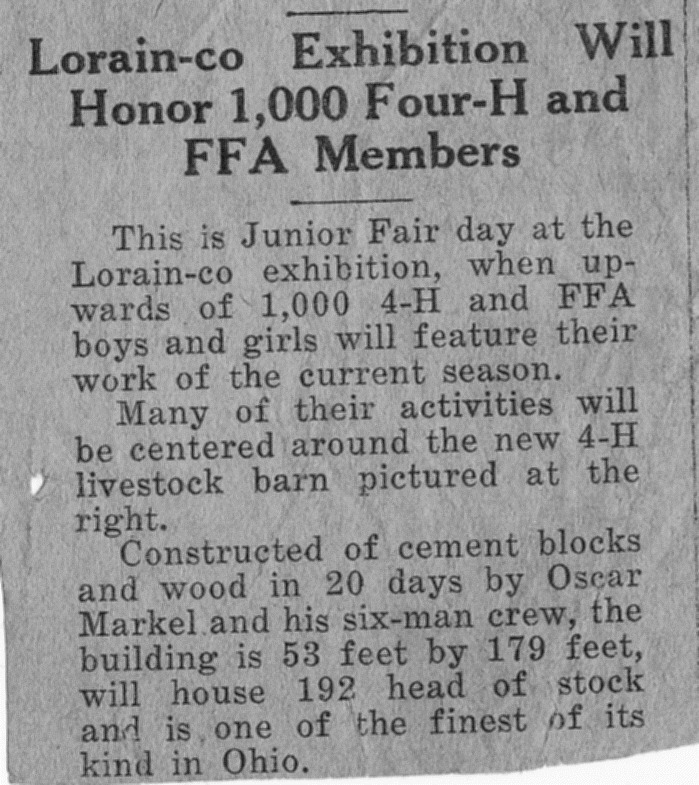 * Oscar Markel's construction crew would build the 4-H Livestock barn at the Lorain County Fairgrounds (probably in the 1920s), as this newspaper article notes. The barn is still standing in 2011. A photo of the side and the front of the livestock barn. 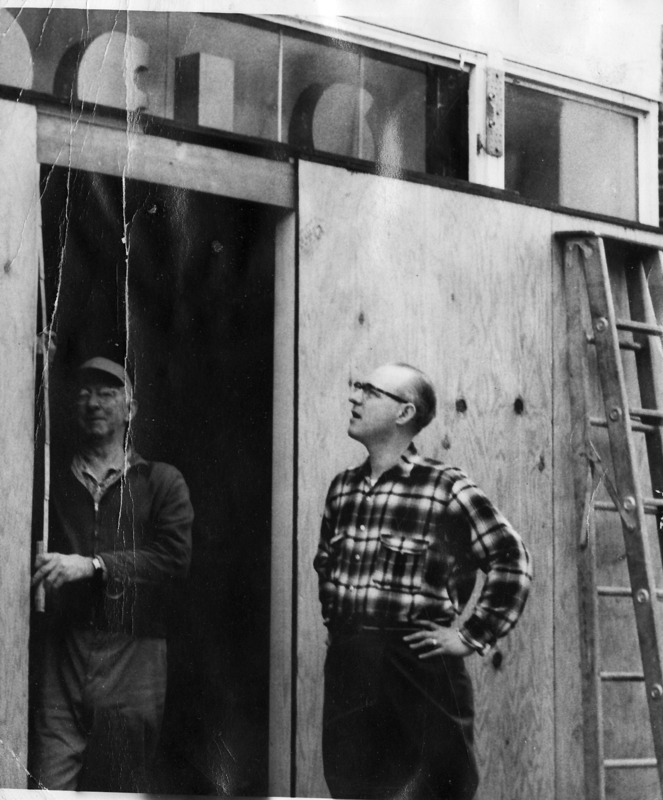 * Oscar doing carpentry work for Mr. Aldrich (right) at the Wellington Shoe Store. 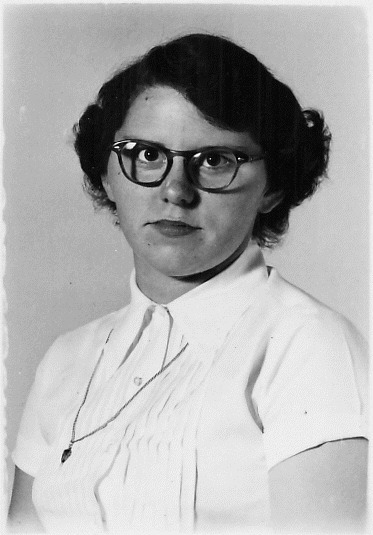 * Bernice Fry Markel from a school portrait. * Oscar and Bernice in an early portrait, which may be from their wedding in 1923. 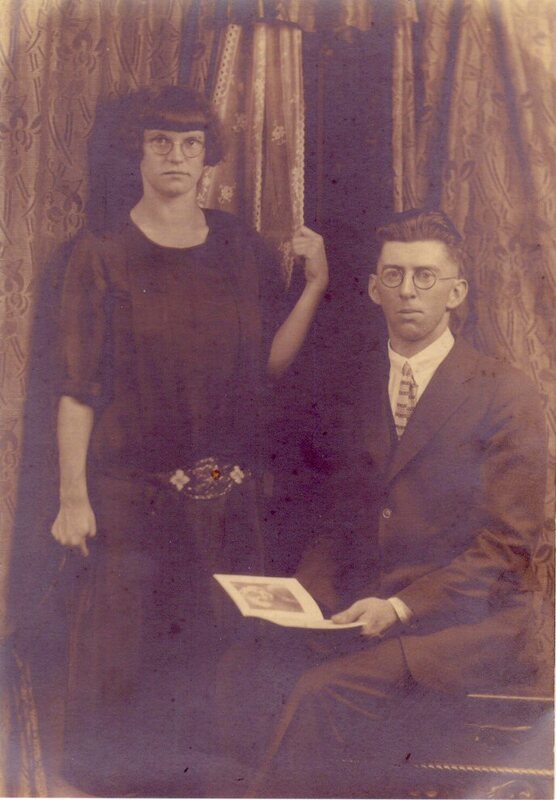 * A later portrait of Oscar and Bernice. 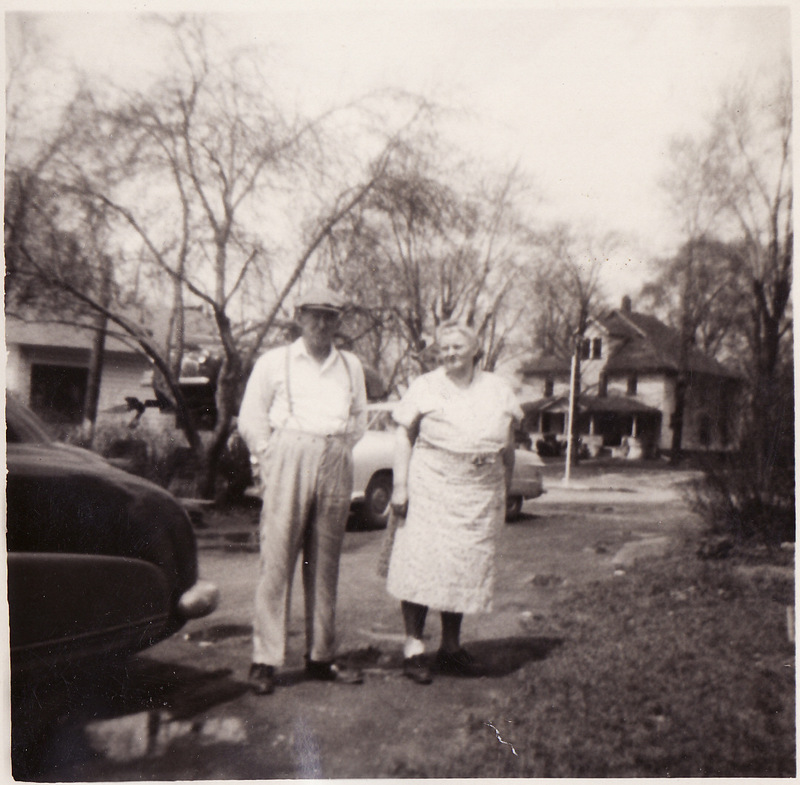 * Oscar and Bernice in their 60s, shot outside in Wellington, Ohio. * One of Oscar & Bernice's early houses at 797 Ohio State 58 in Nankin. This picture was taken at Halloween in 2010. 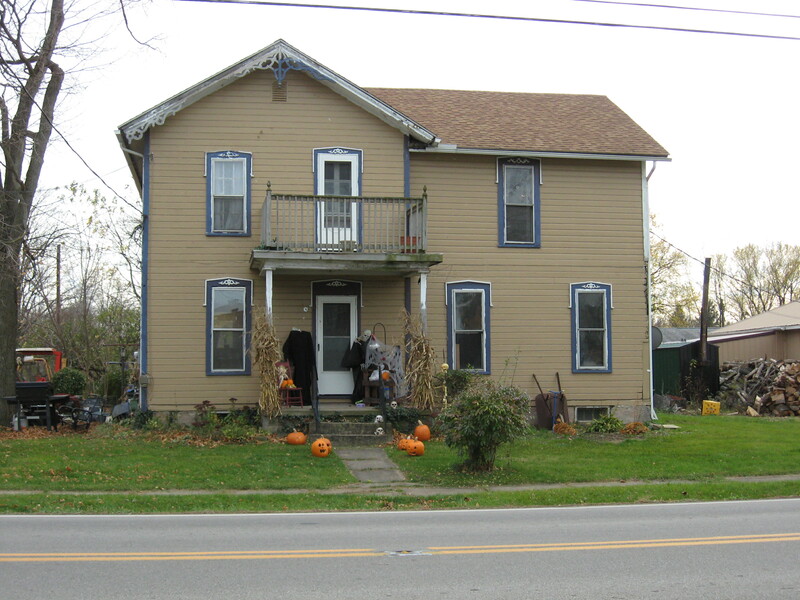 The house, where they lived in 1930 was just west of Bernice's parents' farm. 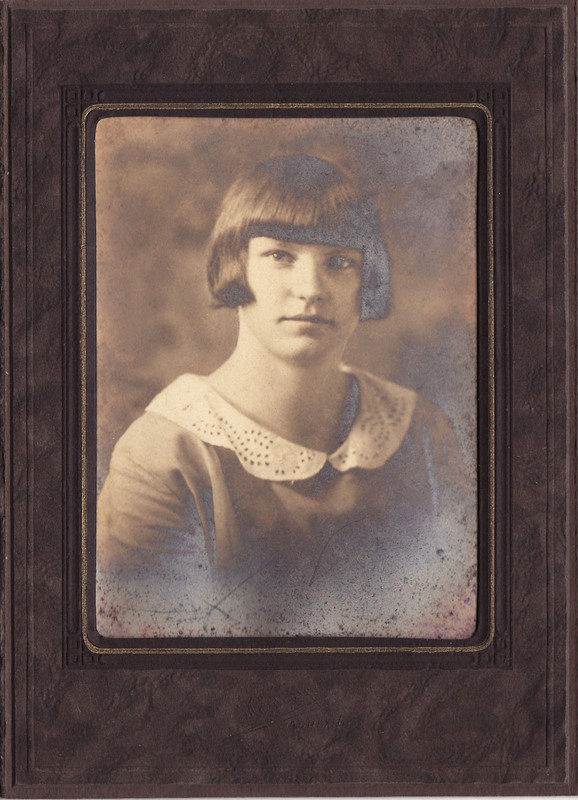 Montgomery Fry, her brother, was also living there when the 1930 Census was taken. The Census lists Oscar's occupation as "truck driver" and Mont's as "factory laborer." 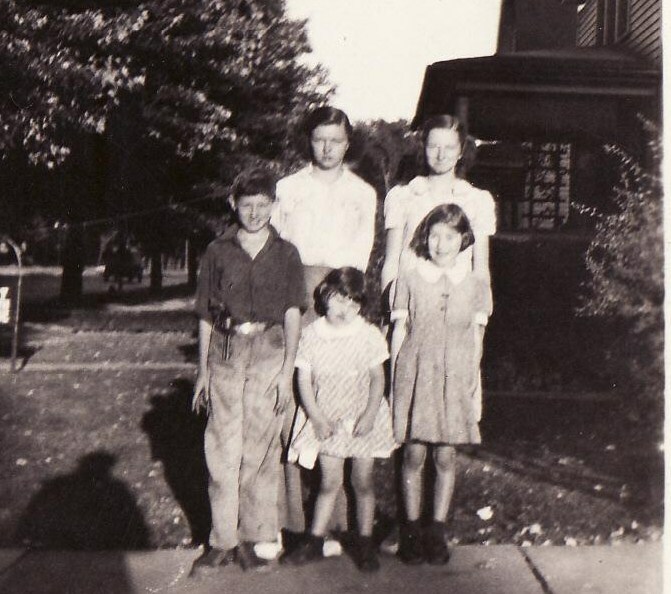 * The eldest 5 kids in front of 411 West Herrick in Wellington, OH, probably around 1940. Back row: Evelyn, Betty; front row: Rolland, Anna, Lona Mae. * Oscar and Bernice with the children in April 1958. 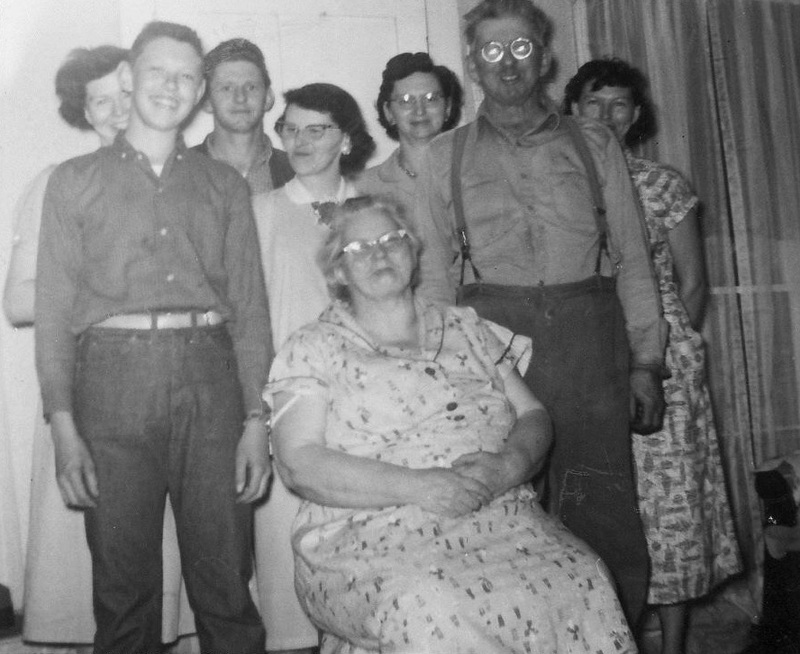 From the left: Lona Mae, George, Rolland, Anna, Betty, Oscar, Evelyn -- and Bernice sitting. * Four of the children in their 60s: Rolland, George, Anna and Betty. * Samuel Rolland Markel and George Allen Markel outside the West Herrick house in Wellington, OH. 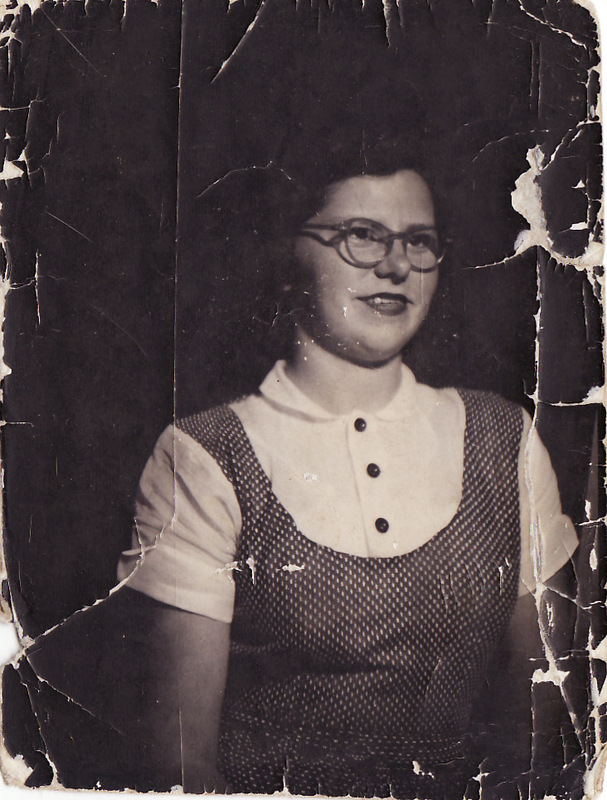 * A young picture of Anna Markel. * High school portraits of Anna Markel: Picture 1 and Picture 2. * Anna or Betty? There's some debate over this but the picture on the table is a high school picture of Earl Fry. * Robbie Kimbler, Anna Markel's husband. * Evelyn Markel and husband James Biggs.